They are available in limited quantities , most for a lower price than new metal. 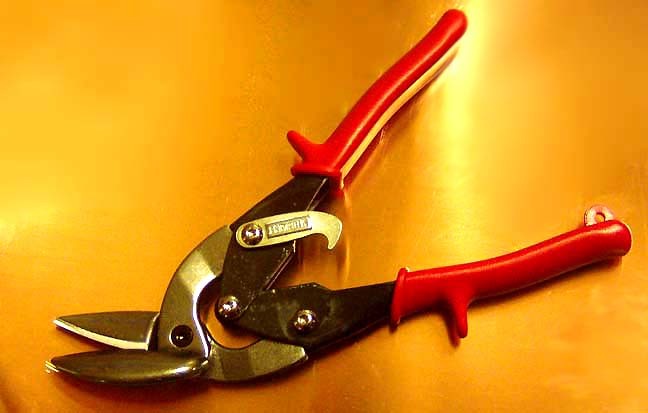 This metal may have some water spots, scratches or dents and ranges from shiny to dull. All is usable. This is an assortment of our embossing foils. 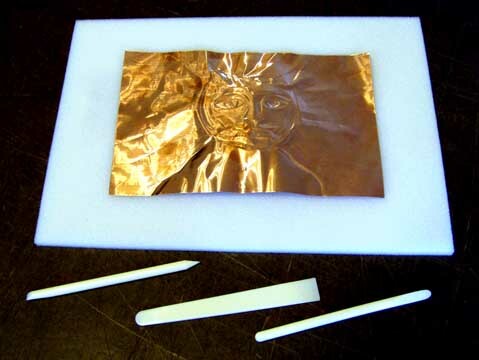 It may be roll ends, cut offs, or mis-cut pieces of our 36 and 38 gauge embossing foils. 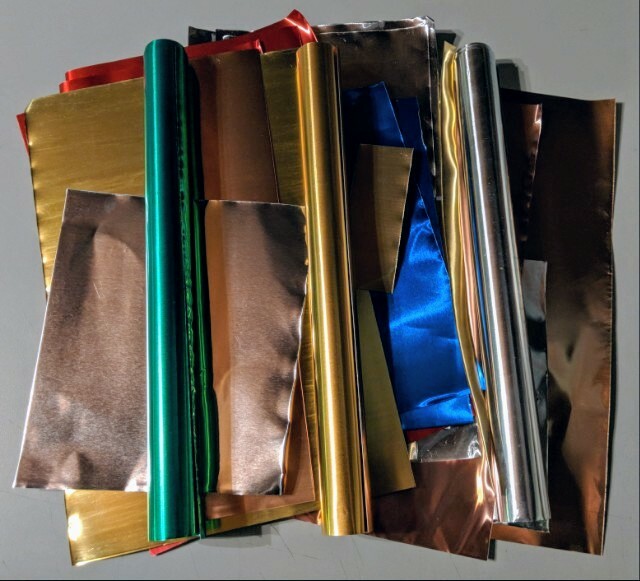 Each assorment is different but will contain some each of COPPER, ALUMINUM and BRASS sheet as well as COLORED ALUMINUM FOILS - Great for collage work. It will be a variety of thickness, sizes and metals. Some material may be rolled. This sheet metal may have scratches, folds , dents, tape residue, finger prints and/ or water spots . 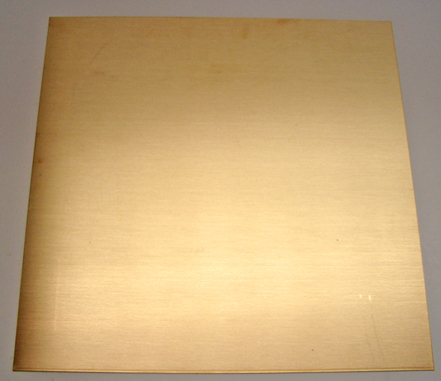 The brass, bronze, copper and alumimun sheet is uncoated. 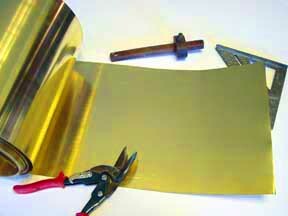 The colored aluminum foil is red, green, blue, copper-tone or gold on one side. All pieces are very interesting & usable. They are great for small craft work and model making. 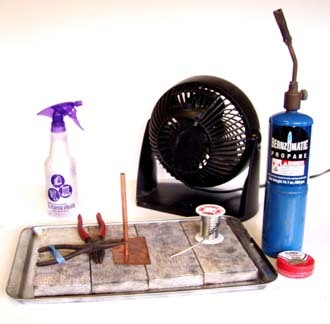 We use these metals for most of our sculptures. Each assortment is different - each is a 'grab bag' and there is no choice of contents. A great starting set for craft work! & A Great Gift for the tinkerer, artist or sculptor. CAUTION: Raw metal may have sharp edges. Handle with care. These metals and the packaging are not for use by children. This is an assortment of miscuts, roll ends and scratched and dented metals. Pieces may be perfect, rippled, stained or scratched . 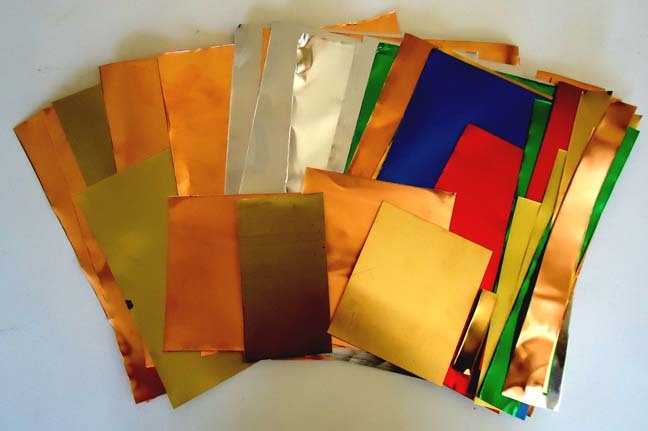 Each assorment is different but will contain COPPER, ALUMINUM and BRASS sheet as well as COLORED ALUMINUM FOILS - Great for collage work. It will be a variety of thickness & sizes. Some material may be rolled. 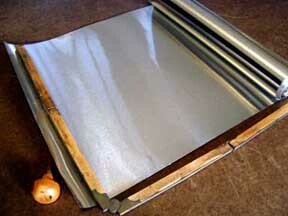 This sheet metals may have scratches, folds , dents, tape residue, finger prints and/ or water spots . The brass, bronze, copper and alumimun sheet is uncoated. 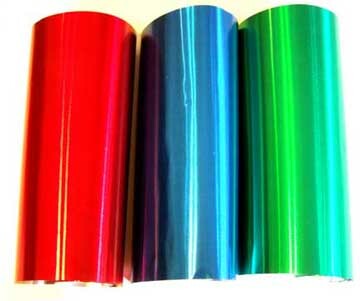 The colored aluminum foil is red, green, blue, copper toned or gold on one side. Pieces are mostly rectangular with some odd shapes. Photo shows the wide range of metals that may be included and not any assortment specifically. 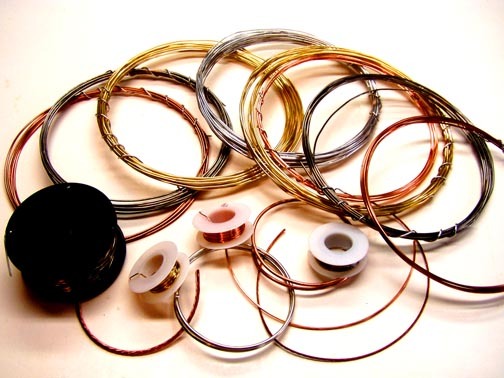 This is an assortment of hundreds of feet of vintage, new, & recycled/ reclaimed craft wire. It is priced at a fraction what new wire would cost. All wires are uncoated and have not been used. The assortment contains spool ends, cut offs and varied finishes from bright to dull. Photo shows an assortment but each one is different. We use these in many of our creations. 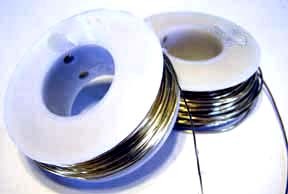 The assortment contains 3 pounds of wire including varied quantities of copper, brass, aluminum and nickel in various thicknesses from thin to thick. Gauges are assorted from many of these : 26, 24, 22, 20, 18, 16, 14, 12, 10, 8, 6 , & 4. some square or half round wire. Lengths are from a few inches to hundreds of feet. There are at least 8 different kinds of wire - 3 pounds total weight. All pieces are very interesting & usable. 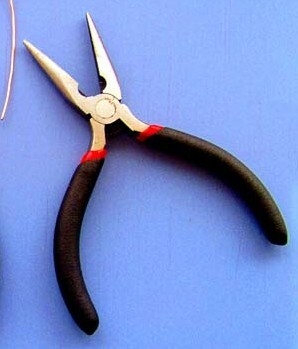 An ideal starting set for craft & collage work at a fraction of the price of new wire. CAUTION: Raw metal may have sharp edges. Handle with care. These metals and the packaging are not for use by children. This metal is available in limited quantities, prices & stock are subject to change without notice. Please refresh this page for the latest pricing and availability. Prices for shipping & handling are for shipment in the US only. Snips, Sheers, Polishing Cloths. Embossing tools etc. These new 'seconds' are roll ends, cut offs and older vintage metals that are too good to scrap. We have rescued (reclaimed) them from reprocessing. These metals are unused. 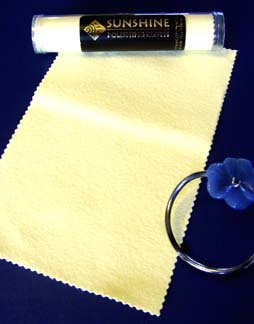 They are ideal for collage art & craft. We use this metal for most of our creations. It is not only less expensive but also has character from age. RECLAIMED: Most of the metal we sell on this page is reclaimed. Reclaimed is better for the environment because it is being used in its original state rather than being reprocessed. 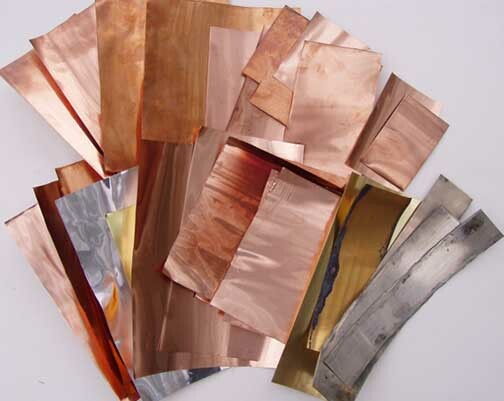 Recycled : Reprocessed metal is also known as recycled. 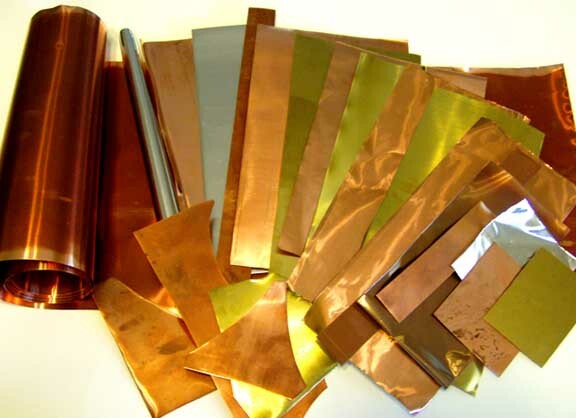 It is metal that is re-melted and re-formed in to a usable form in an energy intensive process. It does save energy over mining and processing virgin metal. Currently these are only produced in small batches. Because the recycled content varies from metal to metal and lot to lot so much it is impossible to know the percentage of recycled content of any specific piece. 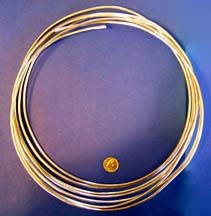 Many of our "new" metals on our web site have some recycled content. 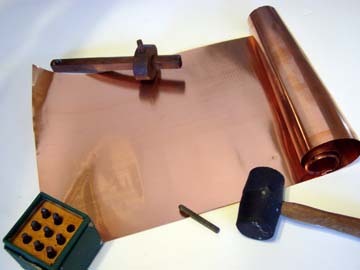 Most of the copper in America is 60% recycled. Vintage Metal: Metal that has wear and patina from age. It is all very usable at a good price. We use this metal in our own creations. Some of this raw metal can be polished. All can be further aged with chemicals. Most sheet metal is shipped in a roll if over 1x1 square foot. If necessary ripples or curves can be flattened by rolling it with a smooth rolling pin or plastic pipe section on a completely smooth surface such as a countertop, smooth wood or heavy glass table. It also can be rolled slightly the other way to flatten. CAUTION: Raw craft metal may have sharp edges. Not for use by children. Some people have sensitivity or allergies with skin contact with metals.It is not advised to use base metals, especially Nickel Alloys,for items for children that contact skin like jewelry, especially pierced earrings. The full content of this site writings, photos and creations are original and copyright protected. (c) Copyright 2015 -All Rights Reserved the Whimsie Studio.